Some have heard of FM Morris Giles, the quiet, unassuming player who plays with the ferocity of a lion. Hailing from Chicago, FM Giles emerged as a strong master in the Fischer era only to take a hiatus until the early 80s. He re-emerged with a vengeance, taking just about every Illinois tournament in sight. However, in the late 80s, his activity begin to wane and he subsequently became inactive. Looking at the brilliance of his games gives one an idea of what we're missing. Employing a Fischer repertoire with openings like the King's Gambit (! ), the King's Indian, and Najdorf Sicilian against any competition, FM Giles flirted with reaching a national rating of 2500 and scored 9-3 in the 1988 U.S. Open. This spectacular result included a brilliant win over GM Walter Browne. One thing for sure, the Chicago FM seemed to prefer sharp play and was extremely tenacious. A fierce attacker, FM Giles took risks, but he seemed under control most times. When going over his games, you'll feel the energy in his execution. 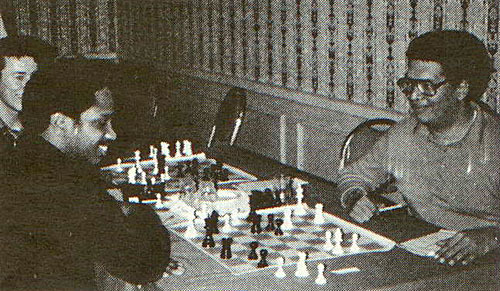 FM Giles was clearly on his way to becoming an IM (and was perhaps IM strength), but perhaps he suffered from chess fatigue after being one of the most active players on the Illinois circuit from 1983-1988. Hopefully, this "Chicago Titan" (not yet 50) will come out of retirement and make his mark once again!